Here's a piece that illustrates Just Alan's take on magic. The entire piece is a very gentle story, one that lulls the spectator into participating in the effect without really making it seem as though they are involved in a trick. As Alan describes, it is all about sharing an experience. Through a thoughtful and subtle use of language, the person participating in the magic (others might call the person a "spectator," but it really does not describe what is happening here) becomes part of the story. Just Alan and this person then share a magical experience. Just Alan was intrigued with the prop. "I thought it was well made and I really liked the effect. But an effect that seems like magic is not the same thing as a magical experience. So I played with it for a while until I came up with this story." Editor's note: The trick involved in the routine that follows is not explained since it is a dealer item. However, we encourage you to study the manner in which Alan has put the routine together to provide a theatrical experience for spectators. You can apply his technique to any number of effects. In addition to the pieces provided with the effect, Just Alan has a worn and faded photograph of his father as a young man. His father is holding a trumpet in the picture. He also has an autographed picture of Harry Houdini. It too is worn. 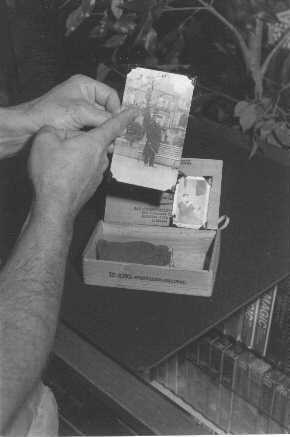 Both of the photographs are smaller than a postcard, something one might hold onto as a keepsake and hide in a special place. Indeed, the set of items are kept in a suede pouch, inside a worn, cedar cigar box. Just Alan chooses his props with great card: "They must be credible. They have to fit me and my story." 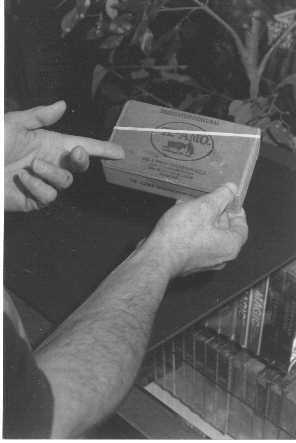 Alan begins by bringing the cigar box into view. Cigar boxes naturally inspire curiosity with their cedar panels and embossed surfaces, so he lets it sink in a bit and then starts. 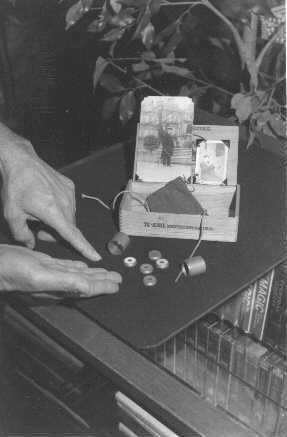 He opens the box facing the participant and the lid is opened to a little over 90 degrees, creating an easel for the photographs he'll show later. In this way, he has created a very natural performance space. The words he uses during the performance are italicized. His explanations and actions are indented. I open the lid and start showing the contents. Look, here's a picture of my dad dated 1925. The picture shows a man with a prominent trumpet which often elicits a response, "He played the trumpet?" I always like to leave room for people to react, to talk with me, which makes the experience real. Notice here how I don't draw attention to the trumpet. I wait. If the person notices the trumpet, then we have a dialogue. If not, then I'll point it out. He played the trumpet at the Hippodrome Theater. He played with this fellow. (I show the picture of Houdini.) Do you know who he is? Again, it's about sharing an experience. In order for me to share, I can't be performing, I have to be talking naturally with the person. So I ask a question and wait for a response. Give and take; back and forth. We are sharing. Yes, that's Harry Houdini, and my father played the trumpet when Houdini performed at the Hippodrome Theater in New York City. And these are my father's trumpet stops. He had them custom-made and enameled -- see, the different colors? I don't know when or where he had this done. There were different stops he'd use on different days, depending on if there was humidity in the air or if it was a sunny day. He said the weather would change the tone of the trumpet and the different stops would compensate and keep his instrument in tune. Here we go back to the point I was making about props -- they must be natural. But how can that be with these foreign objects? Brass discs with holes in the center, each a different color on one side? The story about the stops makes sense and the props don't seem like something a magician might have in his pockets, but rather, they become something dear to me, and maybe a little mysterious since most people have never seen such things. It depended on how he tuned his instrument that day. He used to tune his trumpet like this, backstage. Here I dangle the cover of the brass case on the end of the brass rod and thread, then using the bottom of the case, I tap one to the other, making a clear "ding." Do you know what note that was? (I like to have the person guess. Whatever they say is fine by me, so long as we have a real dialogue.) It may be f-sharp, I'm not sure. I was never very musical like my father. Anyway, he's doing this backstage one day and Harry Houdini walks back and says, "Ben" -- my father's name was Benjamin; but Houdini called him Ben -- "Ben, please stop tuning your instrument backstage ... it's driving me crazy!" My father was a very shy man and he said, "Oh, oh, I'm so sorry Mr. Houdini, I really didn't mean to disturb you. But while you are here, can I show you something?" Houdini said, "Sure." Now the story I'm telling and my actions begin to merge. The past and the present come together. My father took all of these valve stops, turned them over so Houdini couldn't see the enamel colors, mixed them, and asked Houdini to pick one. You play the part of Houdini-pick any of the valve stops, look at the color but don't show me. Then put it back on the table, face down with the others. This sequence is very important. I like inviting the person to be part of the story -- "You play the part of Houdini" does this and people like it. It brings them into the story where I am playing the part of my father. It's now no longer about a magic trick; it's about an experience. It's no longer about me "fooling" someone. It's about us, sharing a magical moment. After the person selects the piece, looks at its color, and replaces in onto the table, I mix the pieces as specified for the effect. 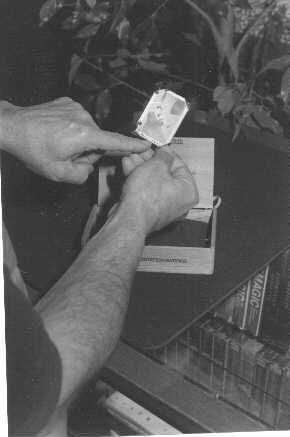 Then, my father put the valve stops into his special brass case, and threaded the string through it so he could clean the stops at one time. And then he asked Houdini, `What color did you pick?' Here the line between role playing and real experience starts to blur. When the person names the color without hesitation, I know they are in the midst of the experience. 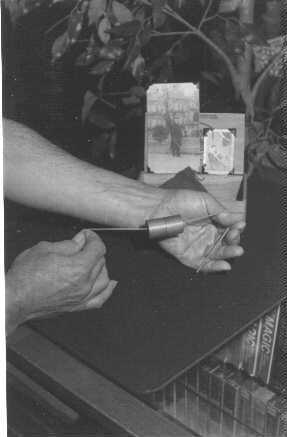 He asked Houdini to hold the ends of the thread (my partner now does this) so the case was suspended between his hands. 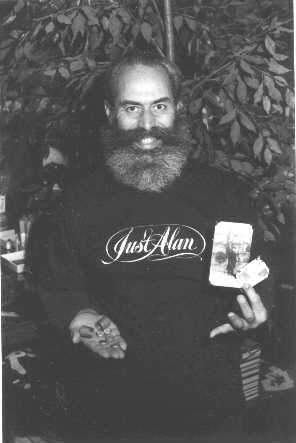 I now make a magical pass -- too few magicians are doing this these days and what a shame, for done gently, it emphasizes that this is magic. I wonder if Houdini learned his escapes from my father? The item that you just read about Just Alan using in his routine, "Dad's Trumpet," is a very deceptive little effect. It has to be the easiest method I've ever seen for something like this: no sleight of hand is required and the disks are all genuine brass, as is the container. $38.50.